Successfully Added Illuminating LED Pokeball Powerbank - 6000mAh, LED Light, Authentic Pokeball Design, Pokeball Nightlight Feature to your Shopping Cart. Become the world’s best Pokemon trainer in the new Pokemon game, Pokemon go. With this illuminating Pokeball Powerbank you can be ensured to have enough power to take your Pokemon adventures to an entirely new level. Catching that flashy Electabuzz or epic Vulpix that you’ve always dreamt of has just become a little bit easier. With this amazing Pokemon Powerbank you no longer have the fear of missing out on catching your favorite Pokemons as a result of a low battery. Get ready to Catch ‘Em All – with the Pokemon powerbank you have all that is needed to bring your Pokemon adventures to the next level. 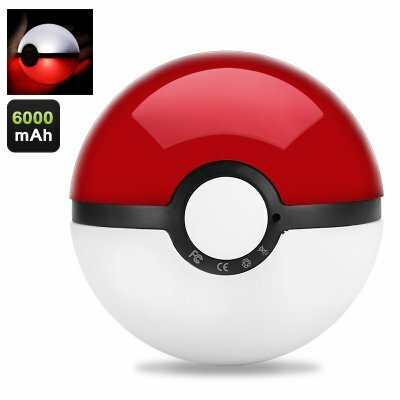 Simply click the front button on this authentic looking Poke Ball and your Pokemon Power Bank will unleash a monstrous 6000mAh of electrical power. Enough to fully charge over three iPhone 6 batteries – with this Pokemon smartphone accessory you can continue your Pokemon adventures for hours before running out of juice. Nothing beats an accessory that shows your current passion for Pokemon Go in the most ideal way possible. With its authentic design and weight this Pokemon powerbank perfectly fits in the palm of your hand, making you feel as if you were holding a real Pokeball ready to catch all your favorite Pokemon. With its built in LED light this Pokemon powerbank lights up when in use, giving an impressive and beautiful effect when catching Pokemon after dark. Not only does this illuminated Pokeball look epic, it also increases your safety as it increases the visibility of your presence to passing by cars and pedestrians. Alternatively this LED Pokeball powerbank can be used as a nightlight to light up your child’s bedroom in style – the perfect little accessory for every Pokemon loving child dreaming to become the world’s next Ash ketchum. This LED Pokeball powerbank is the perfect little accessory for Pokemon Go players and enthusiasts world wide. With this authentic looking pokeball smartphone charger you’ll be sure to never miss out on catching another Pokemon again. Enjoy countless of hours of your favorite new Pokemon game and catch ‘em all with the help if this LED Pokeball powerbank. This LED Pokeball Powerbank comes with a 12 months warranty, brought to you by the leader in portable power banks as well as wholesale electronic gadgets..
Arabic: - تحميل بوكيمون الذكي - Chinese Simplified: - 宠物小精灵智能手机负载 - Czech: - Pokemon Smartphone zatížení - Dutch: - Pokemon Smartphone belasting - French: - Pokemon Smartphone Charger - German: - Pokemon Smartphone laden - Hebrew: - פוקימון החכם טען - Hindi: - Pokemon Smartphone लोड - Hungarian: - Pokemon Smartphone terhelés - Italian: - Carico di Pokemon Smartphone - Japanese: - ポケモン スマート フォン負荷 - Korean: - 포켓몬 스마트폰 부하 - Malay: - Telefon pintar menyeberang beban - Norwegian Bokmål: - Pokemon Smartphone belastning - Romanian: - Pokemon Smartphone sarcina - Russian: - Покемон смартфон нагрузка - Spanish: - Carga de Pokemon Smartphone - Thai: - โหลดโปเกมอนสมาร์ทโฟน - Turkish: - Pokemon Smartphone yük - Vietnamese: - Điện thoại thông minh pokemon tải.